I did a ton of online research before my trip to Reykjavik, and managed to hit up 6 of the 9 spots I’ve listed here. It helped to have friends along, so we didn’t all have to OD on food and caffeine at every coffee shop! Here are some of Reykjavik’s best cafés that’ll allow you to explore the city and its coffee culture; they’ve all got excellent coffee (since I didn’t try any, I’ve left that verdict to my online research), good food for a light lunch, and a quirky and cozy ambiance where you can sink in for a relaxed afternoon. This is an adorable coffee shop in Reykjavik, inside a brightly painted yellow house. It’s so incredibly homey, with its dim lights, mismatched furniture, worn-out couches, and paraphernalia crammed on shelves across the wall. They serve paninis, crêpes, and homemade cakes. Café Babalu is a relatively inexpensive and comfortable spot! Another warm and cozy coffee shop, where I spent a long afternoon on my last day in Reykjavik, writing out postcards. They serve paninis, crêpes, soups, bagels and pastries. Writing postcards is one of my favorite things to do when traveling! This Reykjavik café is a bit further away from the centre of the city but it’s totally worth it because it’s set inside a botanical garden and greenhouse. They serve much more than Icelandic coffee; their seasonal menu is inspired by Scandinavian food culture, and they grow a majority of the ingredients they use in their cooking in their garden itself, for the freshest dishes. This is touted as the best coffee in Reykjavik, and has 2 outlets. Coffee is roasted fresh on site, and you’ll spot tons of locals here! This is a traditional coffee shop, so you’ll find some baked goods to snack on, but not much else. What a cool poster on the walls at Reykjavik Roasters! Cute little spot with colorful walls, armchairs and decent breakfast. Not too many options for vegetarians but you’ll get toast or sandwiches with jam, hummus, cheese or pesto. They have hot chocolate too! They open earlier than other coffee shops in Reykjavik, so it’s a good spot to hit up if you’ve arrived on an early morning flight and can’t yet check in to your accommodation (like me!). Most definitely on every traveler’s list! This Reykjavik café used to be an old Laundromat, and is pretty popular with tourists. They’ve retained a portion of it in the basement, with machines where you can still do your laundry. Pretty cool! Their menu goes beyond just coffee, including lots of brunch options, sandwiches, and burgers. It’s more like an American diner than a coffee shop, I’d say. It is a bit overrated for sure; prices are higher than other Reykjavik cafés, and I didn’t think the food was THAT great. But it’s definitely worth a quick visit for its quirky interiors. It seems like most coffee shops in Reykjavik have that homey feel. Kaffibrenslan is housed in a two-storey cottage, serving coffee, dessert and sandwiches. Considered one of the best bakeries in town, Sandholt is a four-generation-old family bakery serving breakfast, sandwiches, pastries and coffee. They’ve got plenty of seating too, and they open earlier than most coffee shops in Reykjavik. This is great if you’ve landed super early (as most flights in Reykjavik do), or if you’re trying to head out early for your road trip. Much newer to the city than Sandholt, Braud & Co has already established a top spot in Reykjavik’s list of bakeries with its freshly baked breads, pastries, coffee and dessert rolls. There isn’t much seating here, so just pop in, pick up some baked goods and coffee, and continue strolling around Reykjavik. You’ll spot the bakery from afar, with its funky colorful exterior. I’m pretty impressed with how much of Reykjavik’s coffee culture I was able to explore in just 24 hours! I don’t think I’ve ever hit up so many cafés in one city before. It helped that they all served more than just coffee, so I could mix up my orders! 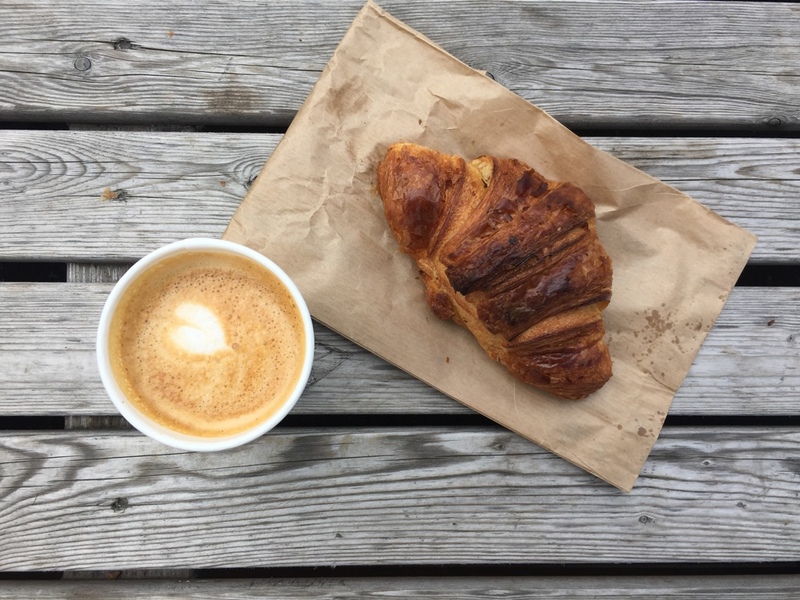 I’d love to grow this list – let me know if there are any other coffee shops in Reykjavik that you would recommend 🙂 In the meanwhile, if you enjoyed this post, check out my posts of some of the coolest coffee shops in New York, Paris and Vienna.